Sony Computer Entertainment President Kazuo Hirai says in a a letter to Congress that Anonymous may be linked to the hacks. (CNN) -- Sony has uncovered a file that could link Anonymous, the highly visible renegade hacker group, to a breach that led to the theft of personal information for as many as 101 million people, the company wrote in a letter to the U.S. Congress. 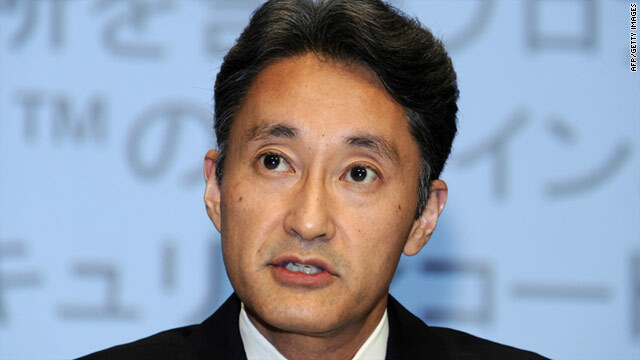 During the investigations, which have gone on for two weeks so far with many online networks offline, Sony discovered a file on its system named Anonymous that contained the group's sort of catchphrase, "We are Legion," wrote Kazuo Hirai, the Sony Computer Entertainment president and America division chairman. The file was found on a server managed by Sony Online Entertainment, a subsidiary that makes online multiplayer games for the computer and PlayStation 3. Sony Online originally thought it was unaffected by the intrusions that hit sister companies, but investigators found that its data, too, was taken during the two-day attack last month. Sony Online, which sells subscription-based games such as "EverQuest" and "DC Universe Online," took its systems offline Monday morning at 4:38 a.m. ET and disclosed the intrusion later that day, a spokeswoman said. The Anonymous file was discovered on Sunday, after Sony found that data had been taken from Sony Online's servers, but she declined to say why the company didn't initially mention the file. Anonymous has gained international notoriety over the last several years for its computer-security attacks on major companies. The group has gone after MasterCard, Visa, the Church of Scientology and government websites for Tunisia and Egypt. Many of the targets are chosen for political or philosophical reasons. Sony found itself in Anonymous' crosshairs early last month in retaliation for suing two people who were distributing instructions showing how to hack a PlayStation 3 game system. Hirai said in his letter that Anonymous members collaborated to overload Sony's servers, a practice of constantly pinging a Web address called a denial of service attack. "You have abused the judicial system in an attempt to censor information on how your products work," a representative for the group wrote in a public letter to Sony posted on its website. "In doing so you have violated the privacy of thousands of innocent people who only sought the free distribution of information." Now Sony is suggesting Anonymous helped facilitate the theft of millions of people's private data. "This cyberattack came shortly after Sony Computer Entertainment America was the subject of denial of service attacks launched against several Sony companies and threats made against both Sony and its executives," Hirai wrote in the response to a congressional inquiry. "Whether those who participated in the denial of service attacks were conspirators or whether they were simply duped into providing cover for a very clever thief, we may never know." Anonymous posted an update to its website after Sony shut down its PlayStation Network and Qriocity media streaming service, titled "For Once We Didn't Do It." The statement read: "While it could be the case that other Anons have acted by themselves AnonOps wa (sic) not related to this incident and takes no responsiblity (sic) for it." Sony says it is working with the Federal Bureau of Investigations and security experts to analyze the situation. They haven't yet identified the people responsible for the breach, Hirai wrote.